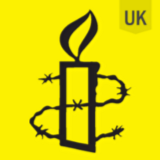 Amnesty International in the UK - standing up for human rights across the world, wherever justice, freedom, fairness and truth are denied. The people trapped in Eastern Aleppo live in constant fear. Sue Lukes, a well-known expert on migration, equalities and housing, shares her family story of persecution, asylum, and courage.